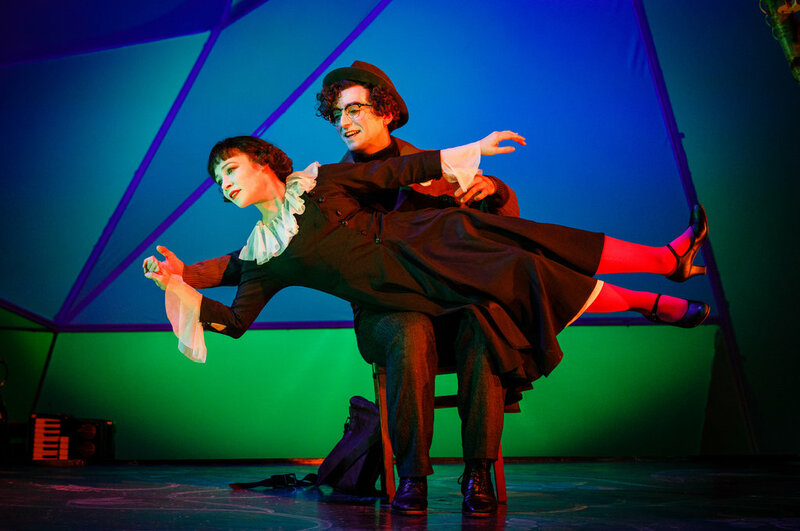 The Flying Lovers of Vitebsk is the story of Russian painter Marc Chagall and his first wife writer Bella Rosenfeld – recreating both the captivating love story and some of his famous paintings with vivid tableaus set to music. 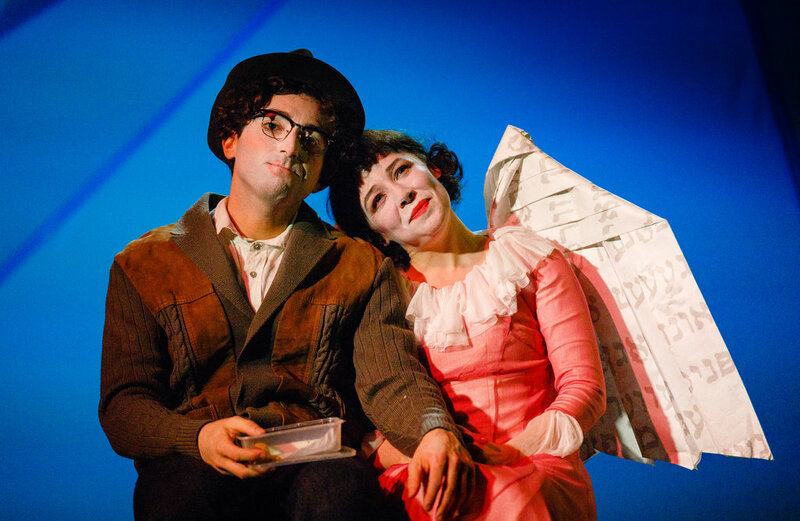 Chagall was born in 1887 and this production by Knee High Theatre Company and Bristol Old Vic at HOME in Manchester has a feeling of nostalgia for the peasant lifestyle in Russia before the revolution. But at the same time it has a very modern feel. The stage is set at an angle, surrounded by a framework that allows props to hang from ropes and the actors to hold on and lean at dramatic angles. A poster of the painting of Marc floating in the air above Bella, craning his neck in for a kiss, was on my wall for years after I went to the Chagall exhibition at the Royal Academy of Arts in London. Chagall died in Paris in March 1985, aged 97, just a couple of days before the exhibition ended. Top the catalogue from the Royal Academy of Arts exhibition in London and bottom the programme at HOME in Manchester. Chagall’s flying lovers stayed in my memory all these years and I couldn’t help but feel a tingle of excitement as Marc Antolin (Chagall) and Daisy Maywood (Bella) moved into the shapes on Chagall’s paintings, recreating those moments. Even they way they moved their feet was incredible. 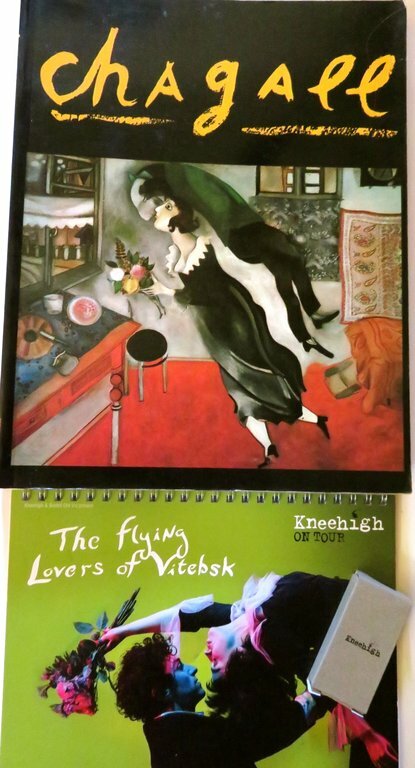 Between the romantic moments, they danced, they sang, they mimed to Klezmer music from Ian Ross and James Gow, bringing on some of the brightly-coloured animals that feature in his paintings – including the green cow and red cockerel. It made the heart sing, like a band playing their greatest hits, and there were moments when we laughed. Marc Antolin’s face was so expressive and mesmerising that he reminded us of young Michael Sheen, and it cannot be long before he is making an even bigger impression. This love story was even more poignant because they were Jewish and ultimately refugees, constantly on the move. Marc was a pioneer of the modern art movement in Paris before the First World War but went back to Russia to marry Bella. He got stuck there during the war, avoiding conscription to the Tsar’s army by getting a job in the supply office of the Russian army in Saint Petersburg. They were swept up in the Russian Revolution and, after moving to Western Europe, just avoided the Holocaust by escaping from France to America in 1941. Bella was his muse and, after she died suddenly in 1944, due to a wartime shortage of medicine. He couldn’t paint for nine months, dedicating himself to finishing her book Burning Lights with his illustrations. 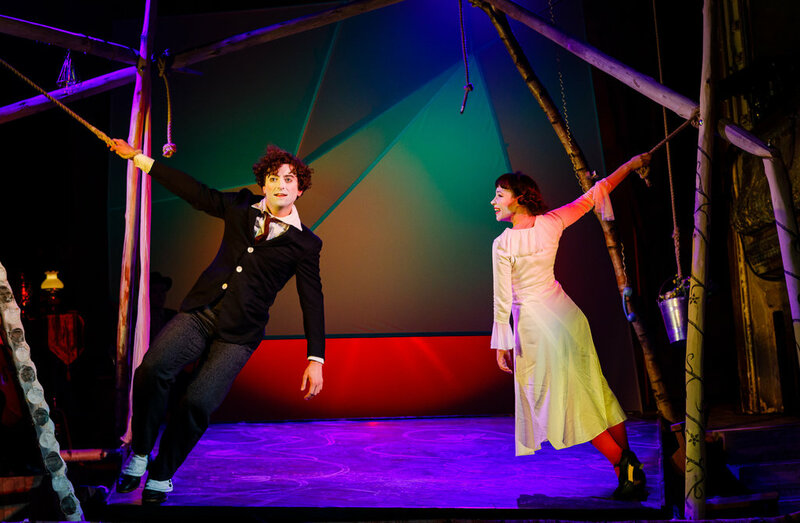 This production has a beautiful, surreal, dreamy quality from the bold use of colour, shadows and lighting, right down to the spiral bound programme with free pencils for the audience to colour in some of the pictures or start sketching on their own artistic journey. 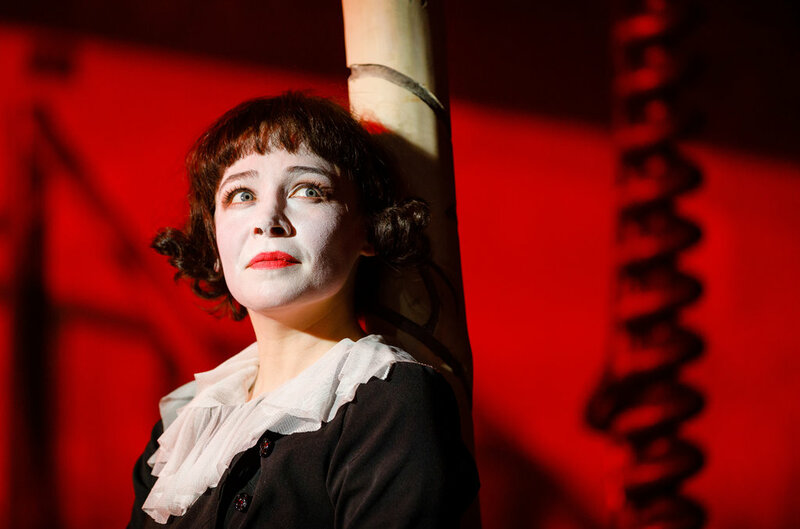 Director Emma Rice, who has worked with the Royal Shakespeare Company, admits in the programme that she has an emotional connection to this production, having played the original Bella with her husband and author Daniel Jameson, 25 years ago, when it was called Birthday. It feels like it was made with love. Some productions do not age well but this felt fresh and new, making us discuss current day politics and the rise of anti-semitism in the bar afterwards. It was emotional and thought-provoking. 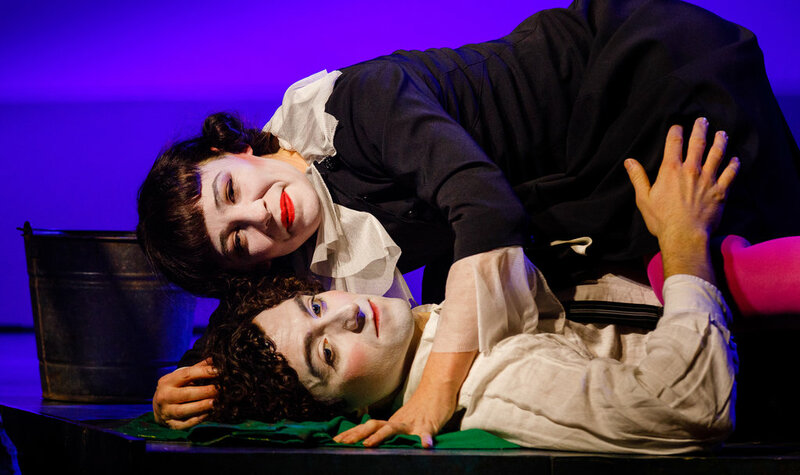 The Flying Lovers of Vitebsk ran to high acclaim at Bristol Old Vic in 2016 and has enjoyed sold-out runs at the Sam Wanamaker Playhouse in London, the Traverse Theatre Edinburgh, where it won the prestigious Carol Tambor Best of Edinburgh Award, the highest honour at the Edinburgh festival fringe, and has recently played at the Wallis Annenberg Centre for Performing Arts, Beverly Hills, California. 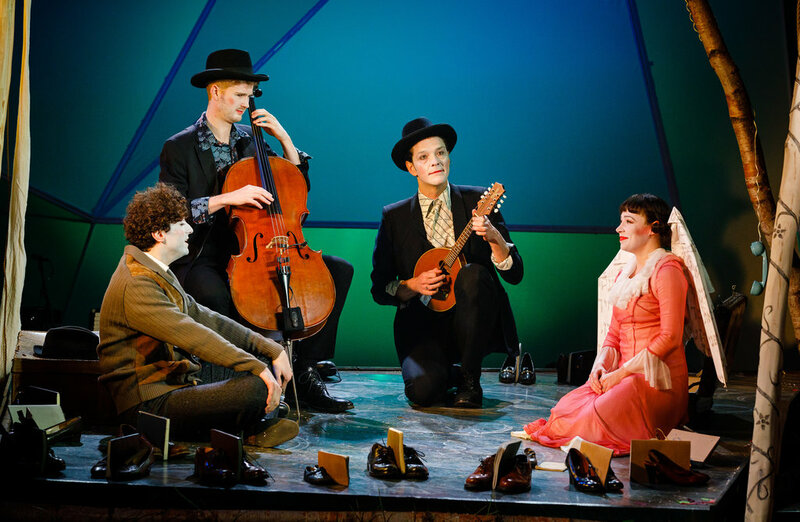 Kneehigh have previously visiting HOME with Dead Dog in a Suitcase (and other love songs) in September 2015, and 946: The Amazing Story of Adolphus Tips in October 2016, and have recently been at The Lowry in Salford with Brief Encounter. The Flying Loves of Vitebsk is at HOME, 2 Tony Wilson Place, First Street, Manchester, M15 4FN, until Saturday 7 April. For more details and tickets visit their website.